If you have morning back pain, your mattress may be to blame. After sleeping through the night, you want to be able to spring out of bed fresh faced and well rested, not aching, groaning and completely exhausted. Yet, many people suffer every morning when much of their pain can be alleviated with a new mattress that properly supports the back and body. A common offender for ruining sleep is a mattress that is past its prime. Mattresses that are approaching 10 years or older are likely to lose the ability to provide the appropriate support your back needs. Over time, old mattress springs lose tension and/or the foam in the bed becomes permanently compressed. As a result, the entire mattress is prone to sagging. This causes the spine to become misaligned when you lie down rather than remain straight. Moreover, an old mattress may become lumpy, which leads to tossing and turning during. This may negatively affect joints, further exacerbate back issues, and interrupt sleep. 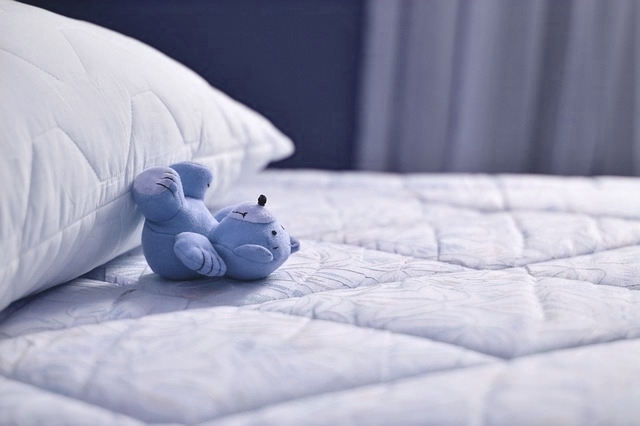 According to mattress expert Kieran MacRae of The Dozy Owl, the materials used to construct mattresses play an important role in helping to eliminate morning back pain. For people who experience back issues after sleeping, he advises getting a mattress that is made with memory foam. Memory foam is a dense, heat sensitive material that contours to the body and provides greater "sink" where there is more weight (shoulder and hips) and less along your spine. This keeps your body better aligned whether you sleep on your side or your back, so you can wake up refreshed and not aching. The other option Mr. MacRae recommends is a hybrid mattress. This type of mattress is constructed with a combination of springs and memory foam. Hybrid mattresses offer a firmer feel than those made with only memory foam. While people vary in their preference for mattress firmness, the most important point is to avoid sleeping on a soft mattress. Soft mattresses do not provide the support required to get a good night sleep, if a sore back is a problem. A firm or medium-firm mattress will allow you to lie comfortably and still at night. Before buying a new mattress, test out different mattresses, if possible, to see which feel the best to you. Lie on your back and on each side to determine comfort. An individual's size plays a role in firmness selection, according to Mr. MacRae. Be sure hips and shoulders have ample "sink" to ensure the back stays aligned. For example, he suggests a firm mattress may suit a smaller-sized person. A medium-firm mattress may be the best choice for someone who weighs more or has broad shoulders, since there will be more "sink" for the hips and shoulders that enable back alignment. Important Note: Always discuss your back pain issues with your healthcare provider. Often a mattress change may be the solution. Yet, it is important to rule out other health concerns.